The Lunar Roving Vehicle (LRV) was an electric vehicle designed to operate in the low-gravity vacuum of the Moon and to be capable of traversing the lunar surface, allowing the Apollo astronauts to extend the range of their surface extravehicular activities. Three LRVs were driven on the Moon, one on Apollo 15 by astronauts David Scott and Jim Irwin, one on Apollo 16 by John Young and Charles Duke, and one on Apollo 17 by Gene Cernan and Harrison Schmitt. Each rover was used on three traverses, one per day over the three day course of each mission. On Apollo 15 the LRV was driven a total of 27.8 km in 3 hours, 2 minutes of driving time. The longest single traverse was 12.5 km and the maximum range from the LM was 5.0 km. 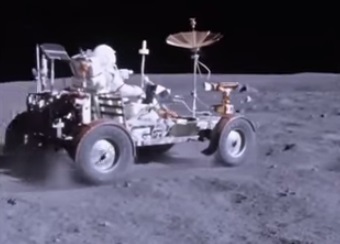 On Apollo 16 the vehicle traversed 26.7 km in 3 hours 26 minutes of driving. The longest traverse was 11.6 km and the LRV reached a distance of 4.5 km from the LM. On Apollo 17 the rover went 35.9 km in 4 hours 26 minutes total drive time. The longest traverse was 20.1 km and the greatest range from the LM was 7.6 km.